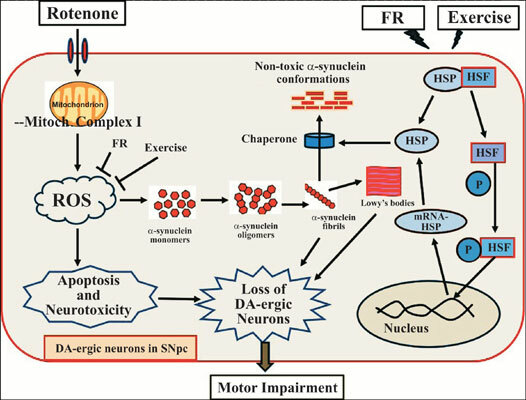 Background & Objective: This study investigated the effects of ferulic acid (FR), muscle exercise (Ex) and combination of them on rotenone (Rot)-induced Parkinson disease (PD) in mice as well as their underlying mechanisms. Method: 56 male C57BL/6 mice were allocated into 8 equal groups, 1) Normal control (CTL), 2) FR (mice received FR at 20 mg/kg/day), 3) Ex (mice received swimming Ex) and 4) Ex + FR (mice received FR and Ex), 5) Rot (mice received Rot 3 mg/Kg i.p. for 70 days), 6) ROT+ FR (mice received Rot + FR at 20 mg/kg/day), 7) ROT+ Ex (mice received Rot + swimming Ex) and 8) ROT+ Ex + FR (mice received Rot + FR and Ex). ROT group showed significant impairment in motor performance and significant reduction in tyrosine hydroxylase (TH) density and Hsp70 expression (p< 0.05) with Lewy bodies (alpha synuclein) aggregates in corpus striatum. Also, ROT+FR, ROT+EX and ROT + Ex+ FR groups showed significant improvement in behavioral and biochemical changes, however the effect of FR alone was more potent than Ex alone (p< 0.05) and addition of Ex to FR caused no more significant improvement than FR alone. Conclusion: We concluded that, FR and Ex improved the motor performance in rotenone-induced PD rodent model which might be due to increased Hsp70 expression and TH density in corpus striatum and combination of both did not offer more protection than FR alone. Mice, Hsp70, tyrosine hydroxylase, Parkinson disease, alpha synuclein, ferulic acid, exercise.